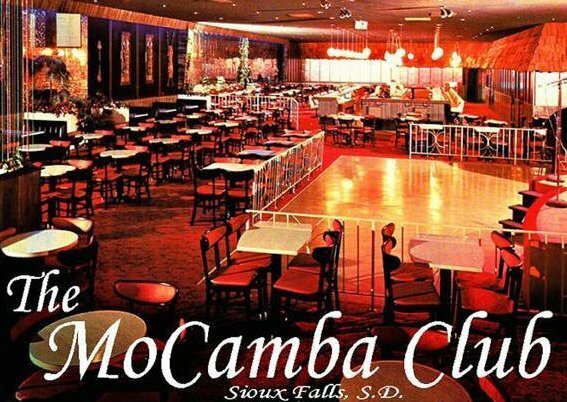 The Mocamba Club in Sioux Falls was one of the premier nightclubs in the Midwest, featuring the largest bar in South Dakota. But live music is what gave the Mocamba its reputation. The first band hired in 1969 was the Big Thing. Owner Bud Brown found the band playing in another Sioux Falls club and hired them away. The Big Thing became Chicago Transit Authority, and later, Chicago. Another crowd favorite also was from the Windy City – the Mob, which was inducted into the South Dakota Rock and Roll Music Association in 2011. Big Al, Jimmy Soul, Jimmy Ford and friends always packed the Mocamba Club. • Bill Chase’s band was fired from the club after the guitar player stripped off his shirt and played an ear-piercing solo. • Buddy Rich, who required a large pepperoni pizza and a gallon of chocolate milk, took one bite of pizza and one drink of milk and threw the rest away. • Basie’s contract required a television in the dressing room so his band could watch major league baseball’s All-Star Game during breaks. The Mocamba Club ran music nightly. Wolfman Jack, Del Shannon, Bobby Vee, Spiral Staircase, Merrilee Rush, and Myron Lee and the Caddies all appeared at the club. Area bands always considered it an honor to play there. They included Showcase, the Talismen, Wonderband, the Pilgrims, Chuck Singleton and the Houserockers and many more. Myron Lee’s group filled in many nights for bands that failed to show up. Owner Bud Brown and manager Ted Hartenhoff had a decibel gun that registered the bands’ volume. Barry Bryan, a member of Wonderband, stills has a note from the owner that says, “Barry, you are getting very loud. Bud.” Two policemen patrolled the area, and Sgt. Howard Cone was a fixture checking IDs. Vince Rundas was the manager when Hartenhoff left to run Wally Stroman and Bud Brown’s pizza business in Phoenix in the mid-‘70s. Bud’s son Jack, the manager for many years, turned the club into a disco in early 1980, calling it Nite City. Many Mocamba Club memories remain with musicians and fans.